Home Tags Posts tagged with "Hockey"
Duncan, my oldest, will be trying out for a travel hockey team this season at the Mite level. There will be two teams, one A team for the best players and a lower B team as well. In the case a player doesn’t “make” either team during the tryout process, they’re sent back to a development team where they never play any actual games or wear real uniforms. That’s the level he “played” in last season and the season prior. Mite teams are generally made up of 7 and 8 year olds so with Duncan being just 6 years old, it might be a stretch for him to make the cut. 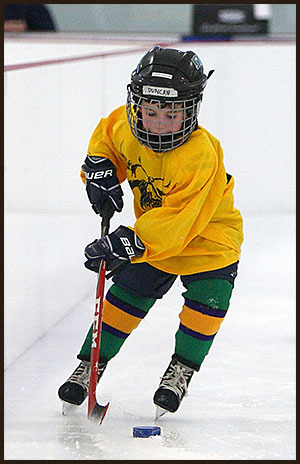 Tryouts consist of skill evaluation in the areas of skating, passing and receiving, stick handling, shooting, play making, and stamina. And then they’re also evaluated in scrimmages to determine positional play and competitiveness. I’ve been trying to prepare him for the past few weeks — he’s never had to knowingly “prove” himself before and being so young, it’s one of those things where if he’s in the right frame of mind, he’ll do fine but if he’s not feeling it that day, he’ll look like, well, someone who has no business trying out in the first place. Not much middle ground, really. It just so happened that this past week at swimming lessons that his instructor didn’t get into the pool with them and instead stood at the edge with a clipboard in hand. Amazed, Duncan very clearly knew *exactly* what was happening — he was being tested on his ability. Afterwards, I told him that what he’d just done in the pool was just like a tryout and I think it set him more at ease. Funny story, though totally unrelated, about “fear” when it comes to the unknown. If someone would have just said, “Kid, it’s a cot on wheels…”, I’d have been a lot more relaxed. So, anyway, I think he’s relieved that he now knows what a tryout is and I’m also relieved that he’ll know kind of what to expect when the day comes. I’m not at all worried about his skating. He’s a little slow in my opinion but still a strong skater and able to stop in either direction meaning he doesn’t have a preferred side. His passing is better than his receiving but I think that’s par for the course at this age. I mean, it’s a pretty rare occurrence to receive at clean pass at this age anyway. His stick-handling isn’t elite but he can deke around people and still keep the puck under control. Stick handling is one of those things, though, that once you start to lose control of the puck, things can fall apart in a hurry. I’m hoping that he finds a good rhythm on whatever sort of drill they’ll use to evaluate this skill. His shooting is, well, terrible and far and away is biggest weakness. Due largely in part to the fact that he’s barely ever had to play in a game with a goalie and it was rarely practiced on the development team. We’ve been working on it at home lately but it’s an uphill battle. Strength is lacking and I’m certainly not going to have my 6-year old pumping iron. 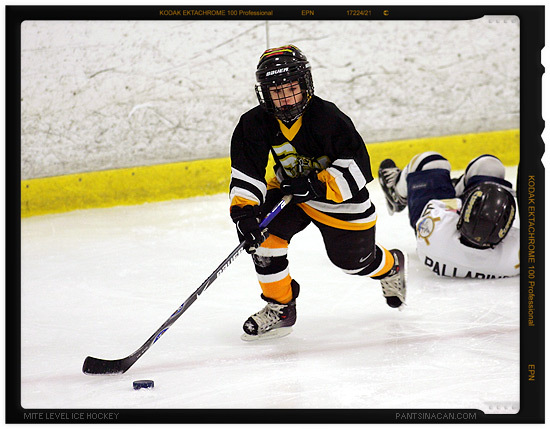 His playmaking, from what I’ve seen in the Spring league games he played with (way) older children, is top notch. He knows where to be and how to get open. Doesn’t so much matter when the kids refuse to pass (a common problem for most sports at this age) but he does have “hockey sense” and I’m thankful for that since it’s something you can’t teach. Either you get it or you don’t. Stamina concerns me a little. Often times, during the final few minutes of practice, he slows down. A lot. All of the kids do but he goes so far as to start slumping his shoulders and looking up at the ceiling. I mean, his play really drops off. And that plays into his competitiveness as well. While he is very competitive (with the vocabulary to back it up) and wants to win all of the time, when he doesn’t get his way, or his team falls far behind, or he gets stopped repeatedly, or no one ever passes to him when he’s wide open, he’ll sometimes give up opting to glide around watching mostly. And, frustratingly, that’s also something that can’t be taught. He knows what to do and where to be…just doesn’t have the fire to actually do it sometimes and that will likely be the difference between making the team and not. So, I should mention that I inadvertently stumbled across a youth hockey program that’ll take a 3-year old player on the roster. The “season” starts May 11th and runs for 8 weeks. I’m pretty excited and I hope Duncan’s enthusiasm as it stands now is still present on May 12th after the first practice. The downside to this program, and it’s a big one, is that it’s just barely local. While I’m less than thrilled about that part of it, I’m trying to look at it like a test run of what’s likely to come. See, youth hockey involves a TON of travel. It’s just not as popular as soccer or baseball where there are dozens of teams at each age level all under one Recreation Department’s control so… even when they’re youngsters, hockey teams are generally of the “travel team” variety. 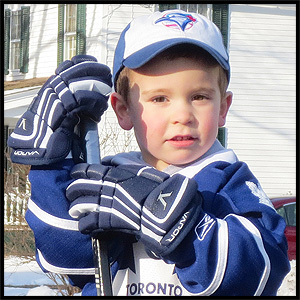 The other advantageous part is that, in the fall when he’s 4 years old, he’ll be able to “transfer” to a team (more on that inna sec) that plays out of a rink 15 minutes from where we live. This summer’s experience will make that commute, provided he still wants to play, feel like nothing at all. Now, when I started playing soccer as a 5-year old, the team that I played for (Go Crickets!) and the league we were a part of were governed by AYSO which is the American Youth Soccer Organization. Our uniforms even sported their logo. Since I was only in kindergarten at the time, I’m not sure if my parents had to sign any sort of contract other than the standard “We won’t sue if he gets hurt” form that would have been submitted with the payment. When I moved to Connecticut, I just played in a town rec league. Yeah, just like a local group that threw something together without an organizing body calling the shots. Oddly enough, even at 7 years old, the players in this program were far, far,far more advanced than what I was used to in the AYSO. So, fast forward 30+ years and change the sport to hockey. Youth hockey in the United States is, as far as I can tell, governed from coast-to-coast by USA Hockey. In order to join a team, I had to register Duncan with them, which I did about a year ago, and he was given an ID number that’ll be attached to him until he’s 18, I’d assume. Thankfully, membership is free for those 6-and-under. And by signing on with this team next month, I’m totally serious about the “signing” part. As a 3-year old, he’s signed a contract with this specific hockey program under the guidance of USA Hockey. In order to play for a different team in the fall, his “contract” will need to be “released” by his current team and then “approved” and “transferred” by USA Hockey to the new team — if they still want him. This is for a FOUR YEAR OLD!? I’m not certain on the reasoning for so much paperwork and, well, processing. I suppose that since, unlike school districts or town rec leagues that have residency requirements, hockey programs draw players from neighboring towns so you don’t want one team scooping up talent on the fly from other teams as if they’re minor league feeder programs without any governing body involved. No joke, little kids have contracts that are “traded” just like the professionals. While I’m sure it is all just paperwork and I’m thinking about this a little too much, can you imagine if there’s a dispute with a program? Like as if they won’t release your contract? I am aware that it does happen, denied releases, that is, but I’m clueless as to the circumstances. Payment issues, perhaps… I dunno. I just think it’s a bit much. Sure, it’s a money making venture for USA Hockey to collect a fee from every player in the country to “grow the game” or whatever, which I totally understand and support, but even for the kids under-6 years old that aren’t paying that membership fee? Really? So we’re counting down the days now until my first born turns 4. For those who’ve been reading the content on this silly website over the years, his “birth posting” probably doesn’t feel like that long ago. Sorry to tell you, it is. Anyway, what’s the big deal with turning 4? 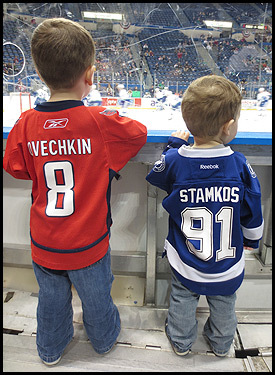 Yep, when he turns 4, he’ll be old enough to sign on with a USA Hockey sanctioned hockey team. He’s excited. And it’s safe to say that I’m excited too. The downside is that he turns four just as the weather is, well, let’s just say it’s not traditional ice hockey weather. Sure, with a little effort, elite level teenagers might be able to find a tournament only team to skate with in June, July, and August but a four-year old? No such luck. Especially in the United States. But that won’t deter us. We’ll work on his stick handling and hockey sense more this summer (as well as with the soon-to-be two years old brother who I’ll predict right now will be the better player eventually) to give him a HUGE advantage over other kids his age. That said, I think he’s already light years ahead of most in his age group, skill-wise, anyway, and that’s not just because I taught him everything he knows. I’m realistic enough to know that he’s likely not the next Wayne Gretzky. But the key thing we need to work on is his skating. 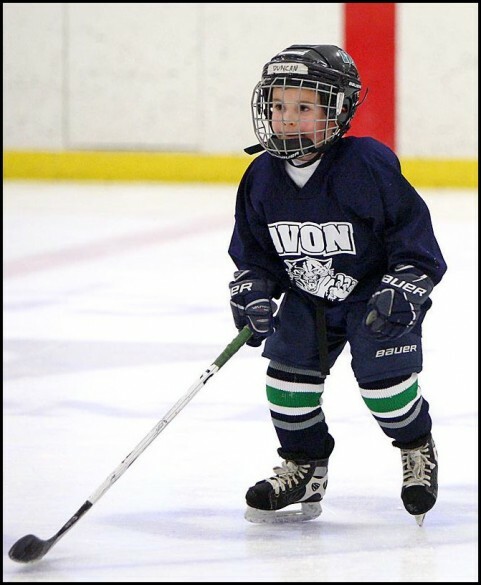 He can be the best stick handler in the world or even have the hardest slap shot but it won’t mean anything if he can’t skate…and, as of right now, there are definitely kids in his age group, though a very select few, that are much further along. He’s been on skates now for almost and entire year. There have been really promising ups… and some discouraging downs along the way. One week I think he finally has it and then, the next, it’s like he’s lost all ability to balance himself on strips of metal 3mm wide…on ice. I’m not going to push him like a crazy honey boo-boo type of parent but I’m certainly going to encourage “hockey” every chance that I get. So far, my enthusiasm is met and both kids take direction really, really well. I’m ecstatic. The plan is to be on the ice at least once a week from April through September — with a slight chance of a “real” learn to skate class worked in as well. Most hockey programs require a learn-to-skate class (within their program) prior to joining a team, especially with such a young player, but I’m hoping to bypass that entirely. He can skate in circles or around cones all he wants with me during a public skate. What I can’t offer is a real hockey environment in full equipment. He wants to be a “hockey guy”, not take lessons. I took a learn to skate class as a kid. For me, it felt more like an introduction to figure skating… and that’s not really what I wanted or needed at the onset. Don’t get me wrong, while I’m not real keen on ever seeing my boys in tight sequin shirts, figure skating is awesome too. The speed a figure skater can generate in two strokes, going backwards, is truly amazing. It’s no wonder than NHL teams usually have a figure skater on staff (usually female too) continually showing the multi-millionaires how to skate properly to improve their game. Most figure skaters could skate circles around any professional hockey player. While twirling. Anyway, for me, while I was a bit older than three at the time, what I needed most was… ice time. Observation, which my kids get plenty of, and ice-time to mimic the movements. A 45-minute session with a world class figure skater once per week, while definitely valuable, isn’t what I think would be best for a little kid just getting started. Two practices a week and cross-ice games on Saturday and Sunday — in addition to a public skate with the family — would make skating like second nature in short order. That’s what jumping right on to a team will offer. Are five days a week on the ice too much for a four year old? My head says yes — perhaps even too much of a time commitment for me. But my kids want to “play” hockey in the kitchen pretty much all the time so… maybe it’s not too much. And, as a bonus, my kitchen floor will be spared some abuse. With the weather being not so nice this weekend, we decided to take a week off from attending an agricultural fair. Instead, on an unseasonably balmy day, I went to our local arena to take in my first hockey game of the season. The temperature (and humidity) difference once I entered the building was enough to fog up my glasses. I love when that happens. Sure, the players aren’t not pro. They’re probably not even 4-feet tall (in skates), but they try their hardest and put on a pretty good show. 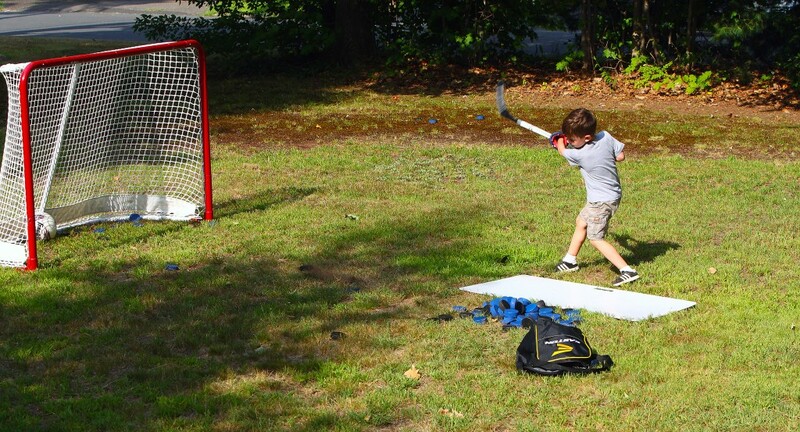 The hits these kids throw, well, let’s just say it’s as good as anything you’ll see in the NHL. Okay, maybe they’re not that great… but there’s nothing quite like the sound of two face cages colliding at full speed. That’s something you don’t hear at the pro level. The funny part about last night was that the league that the players play in tried to hire me — on the spot? !